how he felt about religion and religious holidays. to also have faith in God and Jesus, despite his disparaging comments. they lived. They were to talk about Jesus’ birth. She asked him to come, but he refused ‘That story is nonsense!’ he said. A while later, the winds grew stronger and the snow turned into a blizzard. As the man looked out the window, all he saw was a blinding snowstorm. He sat down to relax before the fire for the evening. Then he heard a loud thump. Something had hit the window. He looked out, but couldn’t see more than a few feet. he ventured outside to see what could have been beating on his window. 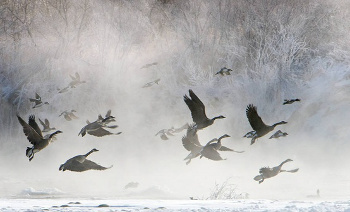 In the field near his house he saw a flock of wild geese. and couldn’t go on. They were lost and stranded on his farm, with no food or shelter. They just flapped their wings and flew around the field in low circles, blindly and aimlessly. A couple of them had flown into his window, it seemed. aimlessly and didn’t seem to notice the barn or realize what it could mean for them. The man tried to get their attention, but that just seemed to scare them, and they moved further away. He went into the house and came with some bread, broke it up, and made a bread crumb trail leading to the barn. They still didn’t catch on. but they only got more scared and scattered in every direction except toward the barn. ‘Why don’t they follow me? !’ he exclaimed. He thought for a moment and realized that they just wouldn’t follow a human. ‘If only I were a goose, then I could save them,’ he said out loud. Then he had an idea. He went into barn, got one of his own geese, and carried it in his arms as he circled around behind the flock of wild geese. He then released it. His goose flew through the flock and straight into the barn — and one-by-one, the other geese followed it to safety. Suddenly it all made sense. That is what God had done. We were like the geese – blind, lost, perishing. God had His Son become like us so He could show us the way and save us. As the winds and blinding snow died down, his soul became quiet and pondered this wonderful thought. Suddenly he understood why Christ had come. Paul H. Dunn - "Come and Follow me"